February 29, 2012...68 years ago...Allies launch Operation Brewer. 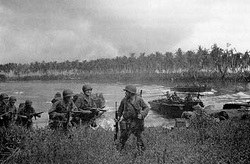 The Admiralty Islands campaign (Operation Brewer) was part of the New Guinea campaign of World War Two. Fighting on the Admiralty Islands commenced 2/29/1944 and ended 5/18/1944. This would be the first combat action seen during WWII by the US Army 1st Calvary Division. The campaign ended in a decisive Allied victory. 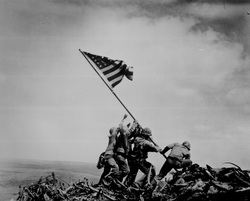 February 23, 2012...67 years ago...American flag raised on Mt. Suribachin. After five days of fighting, Joe Rosenthal took took a picture of six United States World War II servicemen raising an American flag on Mount Suribachin over Iwo Jima. The photo later became the model for the Iwo Jima Memorial (officially known as the Marine Corps War Memorial) near Arlington National Cemetery in Virginia. The memorial, dedicated in 1954, commemorates the U.S. Marines that died taking the Pacific island in World War II. February 19, 2012...67 years ago...USMC land on Iwo Jima. On 2/19/1945, the battle of Iwo Jima (Operation Detachment) commenced with the amphibious landings of the 3rd, 4th, and 5th USMC divisions. Iwo Jima saw some of the fiercest fighting in the Pacific, lasting just over a month. 6,812 US soldiers lost their lives in the attack, and 21,844 Japanese were killed in the defense. On this day, we remember the soldiers who sacrificed much to fight in defense of their country in the Pacific Theater of Operations. February 9, 2012...69 years ago...Victory at Guadalcanal! 2/9/1943, after six months of fierce fighting on the island of Guadalcanal, America declared victory over the Empire of Japan. The Guadalcanal campaign, named Operation Watchtower, was the first major offensive by Allied Forces against the Empire of Japan. On this day, we remember the 7,100 Allied soldiers who lost their lives at Guadalcanal in defense of their country and world freedom.